Israel Hebrew Language Rii i8+ Mini Wireless Keyboard Mouse Combo —- online at $13.99 with this coupon code: Xmas359 and please note that if it is a flash sale, or special offer ends, the price may be a little different! Check Price and More! 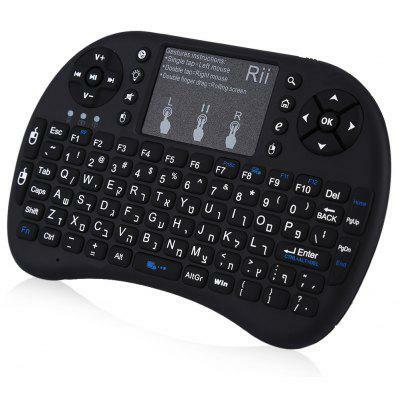 Israel Hebrew Language Rii i8+ Mini 2.4G Wireless Touchpad Keyboard, a great combination of traditional keyboard and mouse. This Israel Hebrew Language Rii i8+ Mini 2.4G Wireless Touchpad Keyboard has drastically changed traditional simple design and taken full replacement of mouse. Adopting multi-point touchpad, it seamlessly realizes man-machine interaction without accessing traditional input devices. Instead of mouse operation, you can easily finished left / right key and roller wheel function just on the touchpad. Get it and be ready for clutter free and non-mouse free playing with your laptop, smart TV and etc.